"For me, raising chickens, for eggs and meat, has been one of the most enjoyable aspects of our family farm. I am a great admirer of "chicken whisperer" Pammy Riggs, and with her two co-authors she has produced an admirably thorough guide to enjoying the pleasures and avoiding the pitfalls of keeping chickens. Get the book, and take the feathery plunge!" 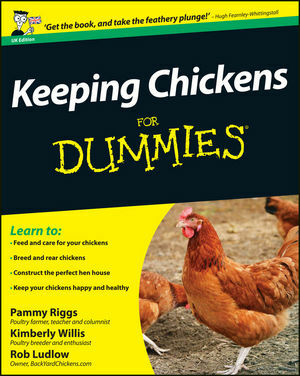 Keeping Chickens For Dummies provides you with an introduction to all aspects of keeping chickens, from constructing a hutch to the correct feeding regime. It offers expert advice straight from the River Cottage ‘Chicken Whisperer', so whether you're looking to raise chickens for eggs, meat, or just the entertainment value and fun - Keeping Chickens For Dummies is the perfect place to start. Pammy Riggs is a well-respected figure in the farming and food industry. She owns and runs the award-winning Providence Farm in Devon and has been a hands-on farmer and small-scale food producer for over 20 years. She has taught a variety of poultry-related courses around the UK, including the poultry-keeping course at River Cottage. Kimberly Willis has raised poultry for more than 30 years. Rob Ludlow runs BackYardChickens.com, the leading chicken-raising information resource on the Web.